Every stunning invitation design from the Chic Party Boutique is created using only high quality design products. You will receive a "proof" of your invitation by email within 2 working days of receipt of your order, for your approval. 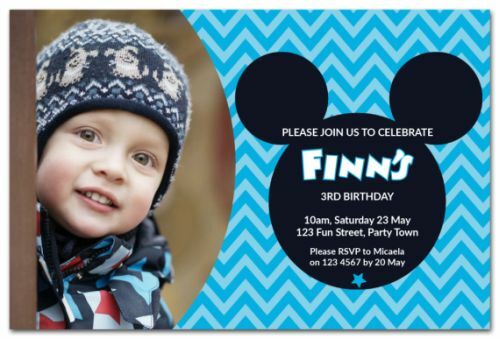 All of our invitations are fully personalised and will arrive complete with all party details included on them. Please complete all details on your order form, including the birthday child's name and age, date and time of party, venue, and RSVP info (including phone number). Shipping: This is a digital product. No physical items will be shipped. If you require printed invitations please contact us for a print quote. Approval of Proof: The print ready file will only be emailed once we have received your payment and approval of the proof via email. Party Extras: For a party with even more sparkle and flair, Chic Party Boutique have co-ordinated party extras to match each invitation design. Select the Party Extras you need from the menu options.